Who is Dinner Me Quickly? My name is Elizabeth and I have a passion of living my life through food. I love experiencing new cuisines, cultivating my herb and small vegetable gardens, learning about the different methods of harvesting our everyday foods, and sharing a meal with my family and friends. Nothing makes me smile more than cooking with my daughters or being the secret resource that helped someone else have a kitchen success. Children are not born picky eaters, that trait is developed through repetition. I truly believe that you can expand a child's range of favorite foods by changing the way you are serving your meals and the manner in which you introduce new foods. I was born into a family that sourced most of our foods naturally. My maternal grandfather was a supervisor at a meat-packing plant and at the age of 84 is still a magician with a knife. My paternal grandparents owned a dairy farm that was in the family since 1879. Naturally, my parents followed in these lifestyles and hunting, fishing, gardening, canning, and large family-style meals were the norm. Spaghetti sauce was always made from scratch and I longed for the winter months when mom would put a stew on the wood stove to simmer and dad would make homemade bread and ice cream for dessert. For me, food is not just sustanance, it is a way of expressing my emotions. I cook when I am happy and I cook when I am sad. When I am feeling creative, I research new recipes and put together a themed meal and when I am feeling bored, I window shop restaurants in my neighborhood. In the 8th grade, I used to bake and decorate cakes for my English class book reports and in college I would skip my classes to prepare dinners for my friends. After the birth of my second daughter, I forged a career in the food service industry. I became the Director of Marketing for Chartwells Dining Services at the University at Albany. We fed over 22,000 students, faculty and staff through 21 dining halls, retail units, convenience stores and catering services. My job was to ensure the integrity of our brands, create unique student dining events, conduct market research and focus groups and communicate all food-related news to the respective audiences. I loved my job. And then, my husband was flying on a business trip and brought me home a magazine he found in the back pocket of the plane seat. There was an article about the start of a new niche in the food service industry - Meal Prep Studio Kitchens. I instantly fell in love with the concept and drove 2 1/2 hours to the nearest studio kitchen to my home 2 months in a row. I put away my laptop, grabbed an apron and started developing recipes. 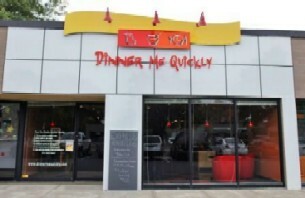 Six months later, Dinner Me Quickly was born. DMQ, as we become known, prepped the ingredients for customers to assemble entrees that would feed 4-6 people. Over the course of my reign at DMQ, we fed thousands of hungry mouths and quickly became the market leader with our branded recipes. My favorite part of the business was helping the hundreds of busy professionals who would visit our business each month for our food, bonding with their friends, and sharing of their lives. Suddenly food shopping and meal preparation became very communal and FUN! We laughed about the fire trucks who came to our houses because our husbands couldn't microwave rice correctly, we supported each other through breast cancer and delivered donated meals to those families who needed them most. I realized that while other people may not share my passion for the lifecycle of food ingredients, we all do want to provide for our families in the best way that we can. We want our children to eat a wide-range of healthy foods and we want to be able to incorporate family meals into our hectic lives. We know that eating at the dinner table each night brings families together, but football coaches and troop leaders don't always share our agenda. Which brings me to why I started this website. Throughout my career, I found that most people needed kitchen help in one of three categories: 1) I don't have the time to prepare healthy, nutritious meals, 2) my kids won't eat it, or 3) I don't know how. Occassionally, I would meet the stressed out working mom who would relate to all 3 groups. For this woman, we would start with sharing a glass of wine. When I mentioned to my friends that I was going to share my recipes, they asked for a few things: teach me how to cook just once and turn it into 2 meals, help me get my children to like it, and please show lots of pictures. Those thoughts were the basis for this website - a forum of resources, a place to share cooking tips and a passion for food. So, as they say, the rest is history. What do I hope will be accomplished? I can't help you with your mother-in-law, but I can give you the confidence you need in the kitchen to portray yourself as a skilled cook, who provides wholesome meals for her family, and that her kids will sit still long enough to eat - even if for only one meal. Enjoy!